Orangeville, Pennsylvania— For many graziers, the woodlot is a place where the livestock end up when they break through the fence. For others, it’s a poorly managed shade lounge for hot summer afternoons. For John Hopkins, trees represent a natural extension of his pasture management. And woodlot management. At Forks Farm, tree lots are viewed as something more than providers of summer shade and winter shelter. They are valued for providing diversity and complexity to the farm’s grazing program. And the grazing stock are viewed as improving the quality and market value of the trees by controlling competing weeds and brush. As with open pastures, silvopasturing requires proper management if forages, livestock and trees are all going to benefit. “With silvopasture there’s the opportunity to manage two canopies — trees and pasture — and increase the carrying capacity for ruminants,” John explains. While John and his wife, Todd, have planted trees along hedgerows in their open pastures, much of their effort has focused on acreage that is already forested. Many of the 50 or so wooded acres under their control are never grazed, but up to one-third of that forest land is eligible for grazing in any given year, and quite a bit of that has benefited from management efforts aimed at improving the performances of forages, livestock and trees. John started out as a forester with an affinity for agriculture. As a boy he rode horses on his family’s Pennsylvania farm. John earned his forestry degree in Colorado, where he was a wrangler on a couple of cattle ranches. He also worked for Colorado’s forestry agency and the U.S. Forest Service. He and Todd bought an “old, beat-up” farm in 1985 that, along with his parents’ farm and some leased property, provides about 150 grazing acres. Over the years they built a marketing business that includes buying clubs, farmers markets and a twice-monthly Forks Farm market at which the Hopkinses and about 25 other local producers offer a variety of products. 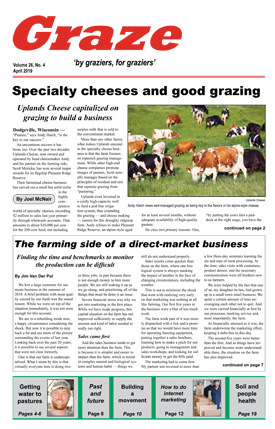 Forks Farm annually sells 60- to 70-head of grass-finished beef, 30 grass-finished lambs and 60 woodlot hogs, as well as pastured eggs, chickens and turkeys. Since demand exceeds their capacity to produce, they partner with other graziers who employ similar practices. The Hopkinses are fencing another 80 leased acres and buying a brood-cow herd to increase beef production. John also works as a consulting forester, and remains passionate about forest management. And there’s a lot of forest management that could be done in this part of the world. “We have a lot of poorly producing woods, second-growth forest and old fields that have grown up into trees or scrub that are non-productive for the farmer,” John explains. While he had the forestry background, the decision to start “tinkering with the woods” wasn’t made until John and Todd decided to add pigs to their enterprise more than 10 years ago. Of course pigs originally were forest dwellers, and heritage breeds such as the Tamworth that were brought to Forks Farm retain that lineage. “I was lucky because I had the tools and the animals and the land, and I had the need,” John explains. For John’s initial foray into silvopasture, he converted four or five acres of woods dominated by Virginia pine. He did some core sampling, and found that tree growth had come to a standstill. Many trees were dying, and they had no real value aside from pulp and biomass uses. The woods was crowded and dark. On the plus side, there was also a significant population of mixed hardwoods that could be of both economic and ecological value if managed properly. John decided to do a selective harvest with a goal of leaving 70% crown cover. The idea was to provide enough sunlight to grow forages beneath the trees. “With more light, trees grow better, too,” he explains. In marking trees to save, he selected for species, form and spacing. John left some softwoods, but mostly focused on hardwoods such as oak, cherry and ash — especially the older, seed-bearing trees. He originally figured that bare ground was needed. “I brought in a highly mechanized operation that had a whole-tree chipper, and sold the trees for biomass. I wasn’t left with a bunch of tops and was able to get paid to clean up,” John describes. Larger acreages need to be harvested to justify the big equipment, so John thinned more than 15 acres. Only a portion of this was converted to silvopasture. Experience has taught him that such a cleanup isn’t as important as he’d thought. John has not used this approach in subsequent silvopasture conversions, and he does not recommend it in his consulting work. “I tell clients that the slash, tops and debris are very valuable for keeping carbon on the land, preventing erosion and even preventing deer browsing on stump sprouts,” he explained. Since that first conversion, John has mostly been cutting about an acre a year and using leftovers for firewood. Pigs readily do some of this work. When piling brush left after logging in an effort to expose more bare ground for seeding, John realized that pigs enjoy tearing up woody debris. They glean the leaves and pick it clean. “It has kind of a recreational component for them,” he explains. Now when he fells and limbs trees, John knows he can leave the tops for the pigs. Later he’ll come back and cut the larger-diameter leavings for firewood. Everything that remains of the tops and other slash are run through a tractor-mounted chipper. The chips are blown out in the woods, and they could also be used for bedding. Another alternative would be piling the slash and burning it. The understory comes in lush after trees have been removed, and sometimes that includes problem invasives. But the pigs take care of that problem, too. John has a recipe for using pigs as renovators to establish pasture. After letting them disturb the land for two weeks, he broadcasts orchardgrass and perennial ryegrass. The pigs remain for another week to cultipack for better soil-seed contact. Some stands establish quicker than others, but John has always succeeded in producing thick swards within a year. “I’ve had cases where I first grazed the pigs in the spring, and by fall I’d be grazing cattle and there’s some pretty decent grass,” he says. 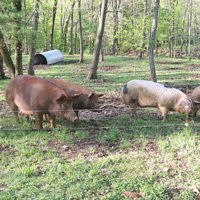 Forks Farm pigs graze from spring green-up until mid-fall, although the pigs live in the woods in winter, too. Their total usage comprises six or seven acres of forest each year, with this area changing somewhat from one year to the next. A group of 30 or 40 pigs gets one-fifth to one-third of an acre at a time. Pigs stay in a given paddock for two to three weeks. John says that for his purposes, it’s not worth grazing pigs for just a couple of days during the renovation phase, as they’ll eat only the plant tops. “We want them popping up roots,” he explains. Long rest periods are crucial when pigs are employed. Once they graze — and root up — a paddock, they don’t return again that year. Sometimes the paddock won’t have pigs again for several years. As with any management-intensive grazing system, grazing duration in a given paddock is a function of stock density and size. As stock weight increases, so does the paddock size. The bigger pigs are rotated through much faster in order to protect the trees and land from damage. “We have put sows and young ones into pretty nice pasture in the woods, but we have to keep them moving,” John notes. He says that one of the advantages of silvopasture is that you can offer your animals nutrition that an open pasture doesn’t have. For pigs, this could be mast such as acorns, walnuts, or hickory. Forks Farm pigs are sold as woodlot pork, and John describes it as a different product that they talk up to their customers. After the pigs have done their conversion, the cattle and chickens enter the silvopasture areas. Cattle graze about 12 to 15 acres of silvopasture in a pattern similar to their open-pasture rotations, grazing half of the grass in a one- or two-acre paddock and then moving on after one or two days. Rest periods are 30 to 50 days, with cattle rotated through most paddocks three or four times a year. Cattle often graze young, developing silvopasture more intermittently. And of course the trees offer summer shade and winter housing. Chickens are also rotated through the silvopasture areas. John uses a solar charger when he can’t hook onto the high-tensile perimeter fence. A single strand is adequate for cattle, and two strands at 6 and 20 inches work for swine. “We find they’re very easy to graze once we get them trained to electric fence,” John says. Lamb grazing is limited to open pastures, and John admits difficulty in using electrified netting for goats in the woods. Every forest paddock has water and is accessible by 4-WD pickup or tractor on the farm and forest lanes. Pigs get a custom-mixed supplement in self-feeders. Non-native invasives and other aggressively weedy plants are adept at colonizing disturbed ground.Herbicides are not an option at Forks Farm. John says the trick to controlling invasives without chemicals is to ensure animal impact on unwanted species while not damaging desirable trees. “Overgraze what you want to go away,” he explains. John has found that while grazing for a year or two may seem to control invasives, unwanted plants can take hold again later. Some of these species have seeds that lie dormant for more than a decade awaiting the right conditions for germination. Livestock in the woods pose definite risks, from compaction to digging up the roots of valued species. John has a Tamworth sow that loves to pull bark off trees, and his cattle have caused rubbing damage. Young trees are most susceptible, with saplings three to five inches in diameter being too vulnerable to allow grazing within such stands. Thus John has no intention of converting most of his forested land to silvopasture. Bigger trees are also more suited to silvopasture since they provide more shade, bear more seed and have thicker bark and more developed root systems. And the silvopasture blocks here are far from uniform. The mosaic of different stages of succession fits with the Hopkinses’ belief in ecological diversity. Trees can be managed to accommodate livestock needs. For instance, John pruned some autumn olive, an unwanted invasive, to provide backrubs for his cattle. Pigs also need something to rub against. “Normally I cut my stumps flush to the ground, but I leave some 20 or 24 inches high. They love them,” he reports. As with all grazing, John recommends keeping animals moving while closely observing them and their environment. How is the forage doing? What is the impact on the soil and trees? He also recommends always staying clear on, and aligned with, your specific objectives. In the case of Forks Farm, the objective is to properly manage trees and livestock to increase diversity and productivity. John enjoys assisting other farmers and landowners with shared values regarding grazing and silvopasture. “I’m blessed to be able to combine two of my loves,” he says. Tracy Frisch farms and writes near Greenwich, New York.